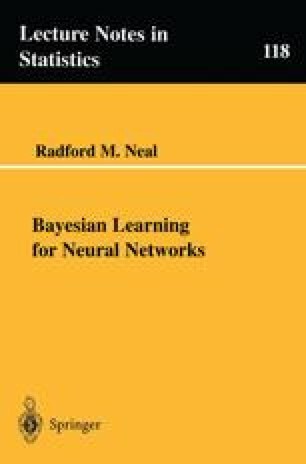 This chapter presents a Markov chain Monte Carlo implementation of Bayesian learning for neural networks in which network parameters are updated using the hybrid Monte Carlo algorithm, a form of the Metropolis algorithm in which candidate states are found by means of dynamical simulation. Hyperparameters are updated separately using Gibbs sampling, allowing their values to be used in chosing good stepsizes for the discretized dynamics. I show that hybrid Monte Carlo performs better than simple Metropolis,due to its avoidance of random walk behaviour. I also discuss variants of hybrid Monte Carlo in which dynamical computations are done using “partial gradients”, in which acceptance is based on a “window” of states,and in which momentum updates incorporate “persistence”.